- Created for the professional user community, the M7 utilizes a PMMA lens and its exceptional light transmission capability. Designed using precise spectrum analysis, this light presents a homogeneous beam and creates an even, dark spot free, glare free light zone. Perfectly suited for parts examination and reading or any task requiring close-up illumination. - With a length of only 4.7", the M7 is easy to carry and use anywhere with the included pocket clip. - The unibody construction of the M7 gives it a high rate of heat dissipation and shock resistance, complementing the built-in multiple tiers of protection system, including low-voltage warning, reverse polarity protection, and over-discharge protection. - Lead-free circuit board, No PWM, no circuit noise, IP67 water resistance rating. - The metal tail switch controls 2 modes: High - Low. - Unauthorized disassembly may damage the flashlight and void the warranty. - Weltool "Total Heat Dissipation" technology will dissipate the internal heat of the light during operation, it is normal to feel the flashlight body temperature rise. - Please check and replace the O-ring regularly to maintain the waterproof rating. - Please check and lubricate the threads regularly with professional lubricant. - Clean the contact surfaces regularly to keep the flashlight normal operation. If irregular strobe or failure to turn-on occurs, the contact surfaces may be dirty and requires cleaning by using alcohol cotton swabs. - Remove the battery from the flashlight during long term storage. 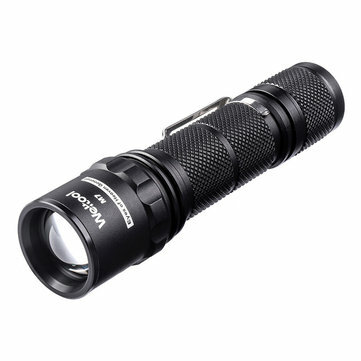 - This flashlight is not intended to be used as a diving light. - Do not aim the flashlight directly at eyes. Keep out of the reach of children.